Again Team Petraglia revealing fascinating evidence on the Middle Paleolithic dispersal of Homo sapiens, and one that fits well the genetic data (speculative “molecular clock” excluded), as well as with the climatic data. The Thar Desert marks the transition from the Saharo-Arabian deserts to the Oriental biogeographical zone and is therefore an important location in understanding hominin occupation and dispersal during the Upper Pleistocene. Here, we report the discovery of stratified Middle Palaeolithic assemblages at Katoati in the north-eastern Thar Desert, dating to Marine Isotope Stages (MIS) 5 and the MIS 4–3 boundary, during periods of enhanced humidity. 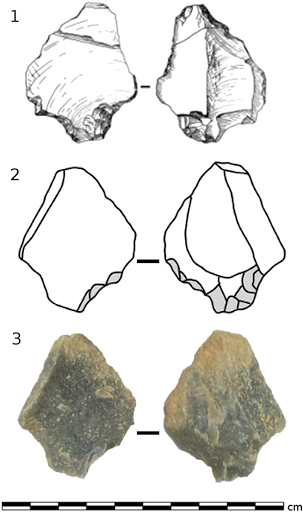 Hominins procured cobbles from gravels at the site as evidenced by early stages of stone tool reduction, with a component of more formalised point production. The MIS 5c assemblages at Katoati represent the earliest securely dated Middle Palaeolithic occupation of South Asia. Distinctive artefacts identified in both MIS 5 and MIS 4–3 boundary horizons match technological entities observed in Middle Palaeolithic assemblages in South Asia, Arabia and Middle Stone Age sites in the Sahara. The evidence from Katoati is consistent with arguments for the dispersal of Homo sapiens populations from Africa across southern Asia using Middle Palaeolithic technologies. Two Levallois cores from S4 and one from S8 exhibit a mixture of distal divergent and lateral preparation of the flaking surface to produce a distale medial ridge resulting in the removal of prepared points (Fig. 3). These reduction schemes are consistent with descriptions of Nubian Levallois technologies (Rose et al., 2011; Usik et al., 2013). A single flake from S4 presents a combination of distal divergent and lateral removals on the dorsal surface and a prior removal of a pre-determined pointed flake,indicative of the use of Nubian Levallois strategies (Fig. 3). Table 2. I added at bottom (red) median OSL ages from table 1. In synthesis: groups of unmistakably Homo sapiens with obvious African techno-cultural heritage were already within the modern boundaries of the Indian Federation around 96,000 years ago (CI: 109-83 Ka). This totally debunks Mellars’ and Mishra’s recent claims, the usual “molecular clock” nonsense (that so many people seems willing to believe at face value), and widens significantly the earliest plausible dates for the colonization of Asia (beyond Arabia-Palestine-Persian Gulf) making findings like Zhirendong jaw (the oldest non-Palestinian H. sapiens remains out of Africa, dated to c. 100,000 BP) much more credible. Until today I was very much in doubt about accepting dates of c. 100,000 years ago for the Asian colonization but since right now I am adopting this model as the most likely one. In other words: it seems clear that the people already settled in Arabia and the Persian Gulf “oasis” did not wait for climatic pressure at the end of the Abbassia Pluvial to send them out in search of new lands: they did it when the pluvial period was still holding the arid gates of Asia open for them. All the evidence adds up well now. Note: the full paper was available at Academia.edu at the time of writing this: HERE and HERE. That is what a new study has found, albeit on just one date. Based on that they argue that the recent claim by Mellars et al. (see also here) about an extremely late date for the migration out of Africa (OOA) becomes more plausible. Have minimal dates of well before 60-55 Ka ago, time when the presence of H. sapiens becomes undeniable from Palestine to SE Asia and Australia. 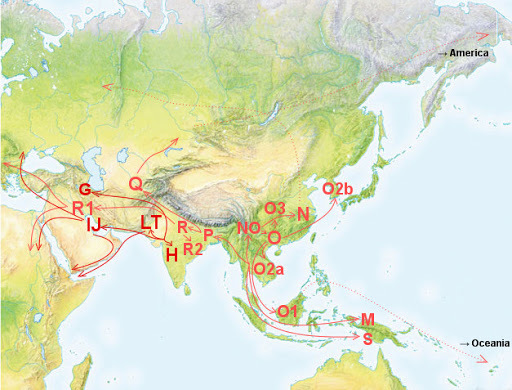 Go at least largely through South Asia; because the distribution and basal diversity of mtDNA M and R, as well Y-DNA F demand it without any reasonable alternatives. The authors themselves acknowledge that the finding is inconclusive in this debate but they choose to lean for a revised Mellars-style interpretation on their own subjectivity. Their hypothesis is not exactly like Mellars et al. These proposed an extremely late (c. 40-35 Ka BP) OoA, which would imply also extremely late colonization of East Asia and Australasia by Homo sapiens (via South Asia). 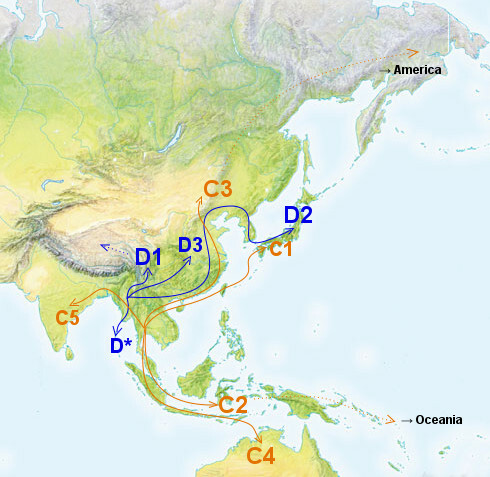 In order to “explain” the lack East Asian blade-like technologies (necessary for the old professor’s ideas about “modern human behavior”) they proposed that the Eastern colonization was led by small populations who somehow lost the technology. But well, as I discussed back in the day, the hypothesis does not stand. Mishra’s revised hypothesis is somewhat more coherent (but still very unlikely): she proposes that East Asia and Australia were actually colonized with Middle Paleolithic technology (neither blades nor microblades) in the time demanded by archaeological data and that South Asia instead was not colonized by our species until c. 45,000 BP, possibly because there was some kind of intelligent archaic hominin (Hathnora? ), which blocked the expansion of our species initially. As I said above, any model that dictates that South Asia was not central to the expansion of Homo sapiens in Eurasia and surroundings must be wrong: genetics demand otherwise. A settlement of South Asia that is posterior to that of East Asia, Papua and/or West Eurasia (other than the initial Arabian trailblazers or boaters) simply does not make any sense. It would require that Homo sapiens would travel through Altai and all the evidence in this North Asian keystone region, a necessary corridor for transcontinental travel before the domestication of camels (or at the very least horses), indicates that it was inhabited by “archaic” hominids (Neanderthals, H. erectus/Denisovans) until c. 47 Ka BP, when industries related to those of West Asia and Europe show up (at later dates associated to H. sapiens remains). A C14 date was obtained for the site of Mehtakheri (near Barwah, Nimar region, Madhya Pradesh) annotated as: >42,900 BP, > 46,555 calBP, >45,028 – 48,081 (68% CI range for the calBP date). Another C14 date from the same site is much more recent (34,380 ± 991 calBP). They also obtained five of OSL dates for section 2 ranging from 41.6(±3.3) to 47.0(±4.9) Ka ago. Another date for this unit of 55.5(±5.8) was not used by the authors because it corresponds to an unstudied layer. Section 3 has older dates (65-78 Ka) but it corresponds to the Middle Paleolithic. 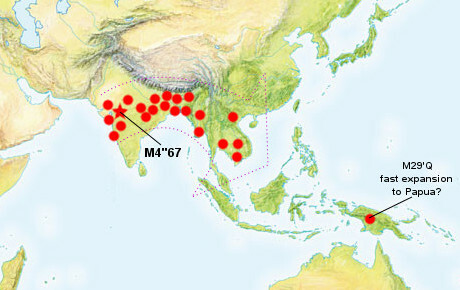 The microlithic industry seems to continue in South Asia until the Iron Age, suggesting that Neolithic and later developments did not substantially alter the demography of the subcontinent. All this is very informative but the conclusions suggested don’t seem to make any sense. It is much more logical to infer that H. sapiens left Africa with an MSA-like Middle Paleolithic toolkit that was not related to the Nubian culture (the dead horse being beaten once and again by both Mellars and Mishra) but to other ill-defined groups of possible South African affinity (as claimed by Petraglia). Insisting on the Nubian techno-complex, when we do not know it reaching beyond Dhofar (i.e. 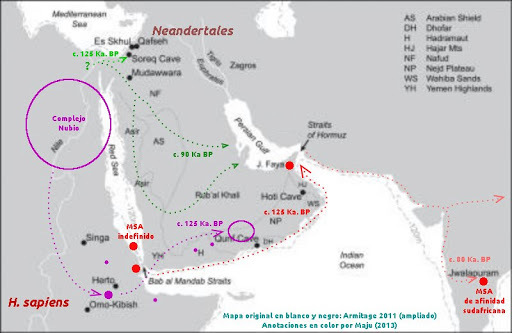 they did not reach the Persian Gulf “oasis”, unlike Petraglia’s trailblazers or Armitage’s Jebel Faya findings) is taking the part for the whole, as if there was not already a much more widespread and diverse African Middle Paleolithic (MSA, Lupenbiense, Aterian) in those times already. Instead these data may indicate a relation of some sort with West Eurasian Upper Paleolithic and African Late Stone Age, which are of roughly those dates. This tentative relationship does not imply migration but would just need some cultural contact. It would be interesting to know more about the MP-UP transition in the area around Arabia Peninsula in order to develop better theories on this tripartite interaction between the West Eurasian early UP, the African early LSA and the South Asian early microlithic industry. These very possible cultural interactions fit well within the wet phase of the Mousterian Pluvial (c. 50-30 Ka ago). I just looked for the first time at the technical issue of what is a microlith (~1 cm long, ~0.5 cm wide) and the published toolkits only seem to have one microlith senso stricto: the J4 point. All the rest have lengths of 2 cm or larger, often 5 cm or more. The presence of some microlith-sized pieces (usually points) in early UP cultures is almost standard: Emirian, Chatelperronian, Aurignacian and Gravettian all them have occasional “microliths” (measured by size) an in all cases these are points, exactly as happens in Mehtakheri. So these toolkits seem to have more relationship, if anything, with Western Eurasian early UP ones, which are roughly contemporary (Emirian is the only clearly older one). other sites in that area of the Italian Peninsula. Being also puzzled because the inventories described suggest a strong blade/bladelet component, instead of microblades. As I mentioned before, I have already got copies of the controversial study by Paul Mellars et al., which argues for a very late colonization of Eurasia. It includes some aspects not dealt with in the first round, when I could only access the supplemental material. While it is maybe easy to dismiss the patterns drawn on ostrich shells in Africa and South Asia as not really looking the same at all and therefore likely coincidence, the visual comparison of the industries is much harder to reject. It does indeed pose a mysterious apparent link similar to others that are hard to explain like the similitude between Chatelperronian and Gravettian (not so long ago treated together as “Perigordian”) or the hammering insistence by some rather marginal academics on the similitudes between the SW European Solutrean culture and the (much more recent) North American Clovis industry. Quite conveniently Mellars ignores Petraglia’s data again, which suggest continuity before and after microlithism in Jurreru Valley and then also finds a transition towards UP (“blade and bladelet”, as well as “backed artifacts”) technologies since c. 34 Ka BP. But regardless, I’m pretty sure that Prehistory-savvy readers have already noticed a major issue in all this chronology: we are talking of dates that are almost 20,000 years after the colonization of West Eurasian by H. sapiens with “Aurignacoid” technologies, which are dated to before 55 Ka BP in Palestine (OSL), to c. 49 Ka BP in Central Europe and to c. 47 Ka BP in Altai (C14 calibrated). And those who are also familiar with Eurasian population genetics are by now shaking their heads in disbelief and claiming to heaven and hell alike. 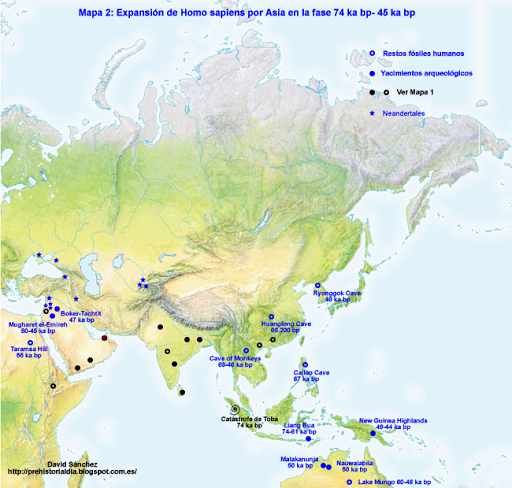 Because West Eurasians derive, at a late relative date, from Tropical Asians and therefore, if our core ancestors were already separated before 55 Ka BP, there is just no room for the Tropical Asian (and Australasian) expansion that must have preceded the Sapiens colonization of the West Eurasian Neanderlands. (Those unfamiliar with the basics of Eurasian population genetics, see here). So there is no way that the Out of Africa migration could be dated to just c. 55 Ka BP, as Mellars does (after grabbing hard the burning nail of conjectural coastal sites now under the sea, which would have to account for some 15-20,000 years of Eurasian prehistory on their own). In fact it is also impossible from the viewpoint of Australian chronology, which again needs to go after the settlement of Tropical Asia but surely before that of West Eurasia. So, regardless of the striking visual comparison between African and Indian industries, which is no doubt the “bunny in the hat” here, the Mellars hypothesis simply doesn’t stand. Was there another cultural (surely not demic) flow from Africa to South Asia c. 40-35 Ka BP? Maybe. Or maybe it is just one of the many hard-to-explain coincidences in stone industry design. But whatever it is, it just cannot be the Out-of-Africa migration, unless one is ready to accept that Aurignacian and related European rock art, as well as Australian rock art, for example, are the product of archaic homo species (something that I am sure that Mellars won’t admit to: it just goes against his “modern human behavior” prejudices). And, even then, it just doesn’t add up either. … Professor Michael Petraglia, an archaeologist from the University of Oxford disputes Richards’ and Mellars’ argument. Petraglia says there’s not enough evidence to rule out an earlier colonisation before the eruption of Mount Toba. “The research reported by Mellars and colleagues is riddled with problems,” he says. is not a consequence of direct migration. 55,000 and 50,000 years ago. He also says genetic dating should be treated cautiously. range anywhere between 45,000 to 130,000 years ago. 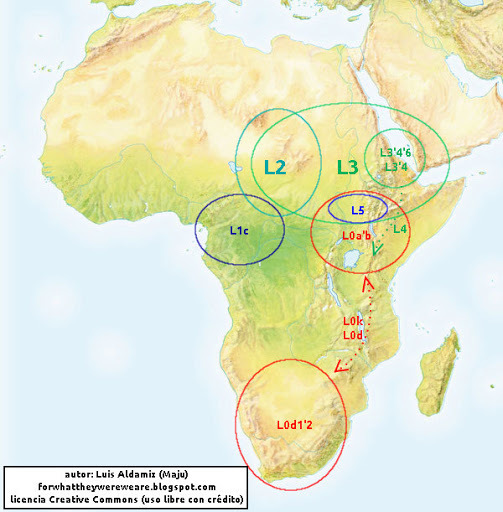 human dispersal from Africa is complex. to support or refute the different theories,” says Petraglia. I do not have yet access to this potentially key paper, so first of all I want to make an appeal here to share a copy with me (→ email address). Thanks in advance. Update: got it (thanks to all who shared, you people are just great!) I will review it again as soon as possible. Update (Jun 18): complementary review of the full paper now available here. It has been argued recently that the initial dispersal of anatomically modern humans from Africa to southern Asia occurred before the volcanic “supereruption” of the Mount Toba volcano (Sumatra) at ∼74,000 y before present (B.P. )—possibly as early as 120,000 y B.P. 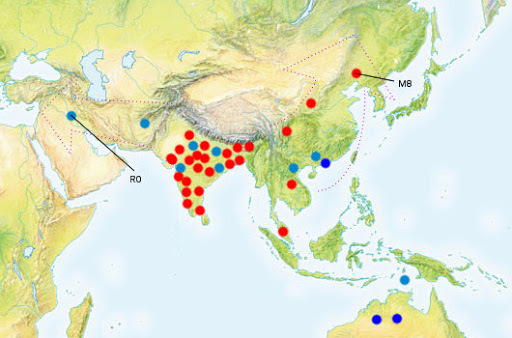 We show here that this “pre-Toba” dispersal model is in serious conflict with both the most recent genetic evidence from both Africa and Asia and the archaeological evidence from South Asian sites. We present an alternative model based on a combination of genetic analyses and recent archaeological evidence from South Asia and Africa. These data support a coastally oriented dispersal of modern humans from eastern Africa to southern Asia ∼60–50 thousand years ago (ka). This was associated with distinctively African microlithic and “backed-segment” technologies analogous to the African “Howiesons Poort” and related technologies, together with a range of distinctively “modern” cultural and symbolic features (highly shaped bone tools, personal ornaments, abstract artistic motifs, microblade technology, etc. ), similar to those that accompanied the replacement of “archaic” Neanderthal by anatomically modern human populations in other regions of western Eurasia at a broadly similar date. A review has been published at Live Science. South Asian artifacts from ~30-50 Ka BP. By “genetic evidence” they obviously mean “molecular clock” nonsense, so it is not evidence at all but mere speculation. However I am indeed very interested in knowing in detail what they mean by “archaeological evidence”, because they seem to get into direct confrontation with much accumulated evidence, first and foremost all of Petraglia’s research in both India and Arabia but also with the quite strong evidence for pre-60 Ka human presence in Australia and growing evidence for pre-60 Ka modern humans in SE Asia (in some cases even as old as 100 Ka). It must be said that Paul Mellars has been criticized before a lot for several reasons but very especially for his adherence to the quite speculative “modern human behavior” conjecture and, relatedly, bigotric attitudes against Neanderthal intellectual capabilities, based on nothing too solid. Therefore I’m generally skeptic about what Mellars has to say on this matter because this kind of conclusion is what one would expect from him. However Mellars is certainly a distinguished academic and, even if prejudiced and stuck to his own old-school and somewhat Eurocentric interpretations, he knows his trade as archaeologist and prehistorian. So he may be onto something, even if it is not exactly what he wants us to believe. For example, it is not impossible that this research may have, unbeknown to the authors, found evidence of a secondary OoA wave (maybe related to the spread of Y-DNA D and mtDNA N?) or even a distinctive evolution in Southern Asian technology prior to the expansion of Western Eurasia. It is interesting that they suggest that the 80-60/50 Ka toolkits of India would have been made by Neanderthals, when they are not describing them at all as Mousterian, the almost exclusively Neanderthal techno-culture, or Mousterian-related. They dedicate much text to attempt to justify a particular version of mainstream “molecular clock” hypothesis, which are clearly broke in my understanding. The kind of arguments “rebated” are more or less what I have been putting forward since many years ago. Ironically their “molecular clock” estimates make N and R much older than M, what I absolutely oppose (just count mutations downstream of the L3 node). No real attention is given instead to the geographical structure/distribution of major mtDNA haplogroups, only mentioned in relation to “molecular clock” speculations. The criticism of the African affinity of the Jwalapuram (Jurreru Valley) cores (Petraglia 2007) focuses on dismissal of any possibility of comparison, rather than on alternative comparisons. Another “criticism” is that there is no apparent connection between Jwalapuram and the Nubian Complex (why there should be any?, it is not the only East African techno-culture, nor the only group that shows indications of traveling to Arabia in the Abbassia Pluvial). Also it is “criticized” that the most comparable African culture, Howiesons Poort) is not recorded before c. 71 Ka BP (what IMO may indicate late cultural dispersals to Southern Africa from East Africa, for example, but, hey!, Mellars is fencing off balls like crazy at his conservative goal). They find clear similitudes between Indian and African microlithic industries (apparently related to the development of “mode 4” in both areas, as well as in West Eurasia). Indian industries are dated to c. 38-40 Ka BP, while African ones are dated to c. 49 Ka BP (Kenya) or later. However West Eurasian ones have dates as old as 55 Ka BP (not for Mellars, who remains stuck in older date references which he describes as ∼40–45 ka [calibrated (cal.) before present (B.P. )]), what really suggest that we are talking here not of the “out of Africa” but of the West Eurasian colonization process (necessarily from further into Asia, genetic phylo-geographic structure demands) with offshoots to the nearby regions. Another element of late Africa-India “similitude” they find is “the remarkable, double bounded criss-cross design incised on ostrich eggshell”, dated in India (Patne) to at least ∼30 ka (cal. B.P. ), much earlier in South Africa. For Mellars this is beyond the range of either pure coincidence or entirely independent and remarkably convergent cultural evolutionary processes. Hmmm, really? Or are we before a clear case of wishful thinking as happens with the Solutrean-Clovis relationship hypothesis? Isn’t it 30 Ka BP anyhow well beyond any reasonable expectations for the OoA time frame, including Mellar’s own conjectures? Even in the case of Arabian colonization, Mellars shows to be in a very defensive attitude, admitting only to the reality of the Palestinian sites with clearly modern skulls, as well as to the area of Nubian Complex colonization (on whose peculiarities he insists a lot, as if it would be the only expression of the wider MSA techno-complex), disdaining all the other MSA colonization areas and, often ill-defined, variants. In brief, for what I could see in the supplemental material, along with some potentially interesting references to the relative cultural community spanning from East Africa to South Asia at the time of emergence of “mode 4” industries, it seems that Mellars and allies are essentially putting the cart (their models) before the horses (the facts), what is bad science. In 2008, Zilhao and d’Errico angrily accused Mellars of being an obsolete armchair prehistorian (different words maybe, same idea). Back in the day I was tempted to support Mellars but nowadays I must agree that he is clearly stuck in a one-sided interpretation of prehistory whose time is long gone. Whatever the case I welcome the debate and can only hope that will help to produce even more evidence to further clarify the actual facts of the Prehistory of Humankind. 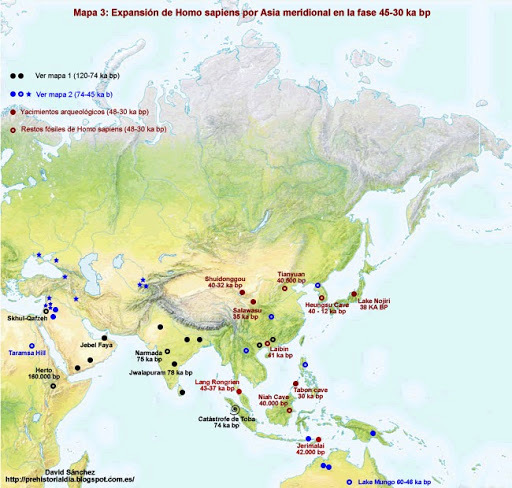 Continuing with the joint series in Spanish language with David Sánchez at his blog Noticias de Prehistoria, I have just written an article on the early expansion of Homo sapiens in Asia and Australasia after the “out of Africa” migration. As usual the review is built upon geographic reconstructions and an overly simple “molecular clock”, in the case of mtDNA only (which is the base of the interpretation), that merely counts coding region mutations from the most recent common ancestor (the L3 node), using the latest version of PhyloTree (build 15). 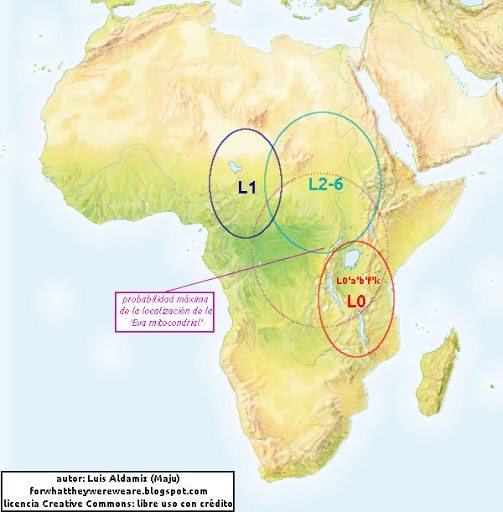 Map 1: the expansion of L3 sublineages from Africa to South Asia. Molecular time: L3+0 to L3+3. 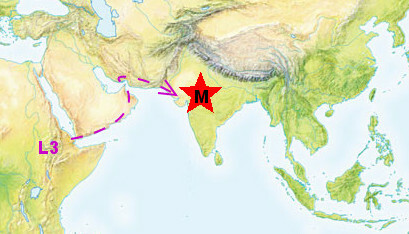 The big M star indicates the large M star-like explosion upon arrival to South Asia. Map 2 represents the molecular time L3+4 (=M+1). There is an evident expansion in South Asia but also into SE Asia. The presence of M29’Q in Papua must be taken with some caution, as always that a single lineage is involved, what has low statistical significance. Map 3 represents the molecular time L3+5, which corresponds to the coalescence of haplogroup N, as well as many M sublineages. There is a slowing down in the number of nodes sprouting at this “time”, so I would estimate it to correspond with Toba supervolcano (c. 74 Ka BP). Map 4 represents the molecular time L3+6, which corresponds with the coalescence of R. The rhythm of expansion recovers and the colonization of Australasia seems by now quite statistically significant. 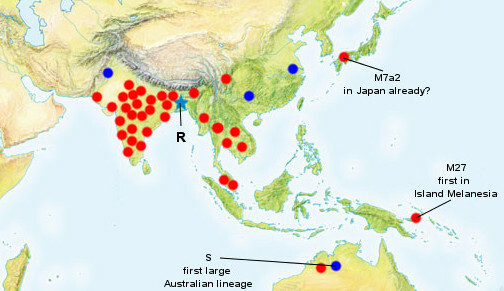 Map 5 represents the molecular time L3+7, which shows the first indications of expansion to NE Asia and Western Eurasia (the Neanderlands), while expansion in South Asia continues very strong (this dynamism of South Asian M lineages may explain why N and R had a limited impact in the subcontinent). I stopped here because I did not want to stretch too much the potential of my simplified molecular clock method, surely more likely to err as we move away from the reference point (L3 node) but the tendencies outlined in map 5 clearly continue and even increase at later “moments”. It is in any case a rough (yet quite coherent) estimate: there is no genetic equivalent of radiocarbon or other physical methods of age calculation. 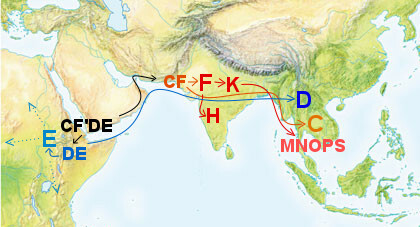 General expansion of macro-haplogroup F and its major descendant MNOPS (highlighted in a lighter, fuchsia shade). 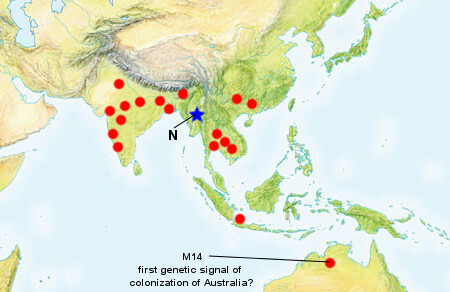 The continuous arrows in these two maps should correspond in essence to mtDNA maps 4 and 5 and even later in time. The dotted arrows merely indicate some important but late processes since at least 30 Ka BP up to the Late Neolithic. In all maps there is some uncertainty about the exact coalescing location of each clade or node but overall they should be at least approximate. Particularly uncertain are the original locations of mtDNA N and Y-DNA C and MNOPS but should all have coalesced somewhere between Varanasi and Guangzhou, so to say. I also mentioned the Denisovan or Homo erectus admixture in Australasia and nearby islands but I will not dwell on it here again. Toba supervolcano only had short-term climate effect → BBC. Research on Lake Malawi’s sediments shows that the climate-change effect of the catastrophic eruption was limited. Droughts previously believed to be from that period have been revised to be from at least 10,000 years before, corresponding to the end of the Abbassia Pluvial rather than to Toba super-eruption. 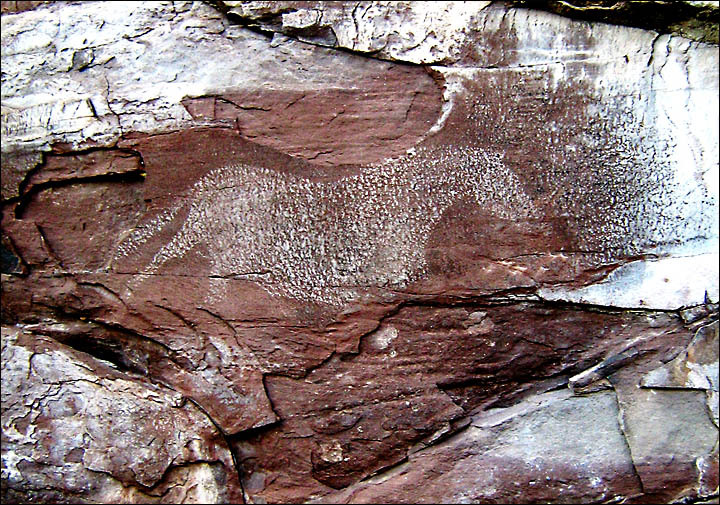 Altai rock art and early astronomy from 16,000 BP → Siberian Times, Daily Mail. Prof. Vitaly Larichev (Institute of Archeology and Ethnography, Russian Academy of Sciences) has detected a whole astronomical structure implemented in the landscape. He claims to have found ‘numerous ancient solar and lunar observatories around Sunduki’. years so. Now the timing is slightly differen’. High on one cliff wall is a rock engraving showing dragon heads in one direction, and snake heads in the other. ‘From the same observation point you can determine true north and south by sighting along the mountains’. Vietnam: early cemetery dug in Thahn Hoa → Australian National University. Some 140 human remains of all ages have been unearthed at the site of Con Co Ngua, estimated to be 6-4000 years old. Cemeteries of this size and age were previously unknown in the region. The site has also revealed a dearth of artifacts. The people were buried in fetal position with meat cuts of buffalo or deer. India: 4000 y.o. stone tools unearthed in Bhopal (Madhya Pradesh, Narmada river) → India Today. Some of them are decorated with aquatic animals. Bell Beaker rich lady’s burial unearthed in Berkshire (England) → Wessex Archaeology. The middle-aged woman wore a necklace of tubular golden beads, amber buttons on her clothes and a possible lignite bracelet. She was accompanied by a bell-shaped beaker of the “corded” type (oldest and roughest variant, of likely Central European inception). The chemical signature of the gold beads is coherent with deposits from Southern Britain and SE Ireland. Giza pyramid construction’s logistics revealed → Live Science. Was there not even a cook in his army? Now we know that at the very least the famed early pharaohs Khafra, Khufu and Menkaure, who ordered the massive pyramids of Giza to be built as their tombs did have some cooks in charge of feeding the many workers who actually built them, stone by stone. These workers were housed in a village some 400 meters south of the Sphinx, known as Heit el-Ghurab. In this place archaeologists have found a cemetery, a corral with apparent slaughter areas and piles of animal bones. Based on these, researchers estimate that more than 2,000 kilograms of meat were eaten every day during the construction of Menkaure’s pyramid, the last and smallest one of the three geometric mounds. The figures estimated for such a logistic operation border disbelief: 22,000 cows, 55,000 sheep and goats, 1200 km² of grazing land (roughly the size of Los Angeles or 5% of the Nile Delta), some 3500 herders (adding up to almost 20,000 people if we include their families). A curious detail is that most of the beef was destined to the building of the overseers, while the common workers were mostly fed sheep or goat instead. Another settlement to the East of apparently local farmers ate most of the pork. There were also temporary tent camps closer to the pyramids. Late Indus Valley Civilization was overcome by violence → National Geographic. The Late Indus Valley Civilization (Cemetery H cultural layer, usually attributed to the Indoeuropean invasions) was, unlike in previous periods, quite violent, new evidence highlights. to his forehead inflicted by a sharp-edged, heavy implement. Gaming pieces of Melton Mowbray (England) → Science Daily. Excavation of a hillfort at Burrough Hill revealed ancient gaming pieces, among other materials. Funerary chamber found near the original location of the Lady of Baza (Andalusia) → Paleorama[es]. The tomb has an access gate and is estimated to be from the 5th or 4th centuries BCE (Iberian culture) and, unlike most burials of the time, the corpse was not incinerated. The finding highlights the need for further archaeological work in all the hill but the severe budgetary cuts threaten this development. 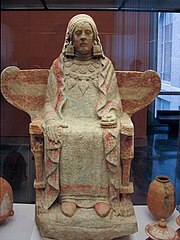 Baza (Granada) hosts a dedicated archaeological museum inaugurated in 2011. Tocharian mummy buried with marijuana hoard → Paleorama[es]. Some 800 grams of the psychedelic plant, including seeds, were found at the burial place of a Tocharian man, presumably a shaman, at Yanghai (Uyghuristan), belonging to the Gushi culture and dated to at least 2700 years ago. The plant belongs to a cultivated variety. Some of the oldest cannabis evidence are also from that area (Pazyrk culture c. 2500 years ago) and also from Nepal (Mustang, similar dates). Later in Southern Central Asia it was used in combination with opium and ephedra, from where soon migrated to South Asia and many other parts of Eurasia. New device radically reduces costs and time in DNA extraction → Science Daily. Researchers from the University of Washington and NanoFacture Inc. have developed a device, which looks like a kitchen appliance, able to extract DNA from tissues (like saliva or blood) in minutes at low cost and without using the toxic chemicals habitual in the field. The prototype is designed for four samples but can be scaled for the lab standard of 96 samples at once. One of the reasons I have been a bit too saturated and maybe not writing as much as usual is that I am collaborating in a series in Spanish language for the blog Noticias de Prehistoria – Prehistoria al Día. Breve introducción a la genética de poblaciones (Brief introduction to population genetics), by me. La primera expansión del Homo sapiens en África desde el punto de vista de la genética (The first expansion of Homo sapiens in Africa from the viewpoint of genetics), by me. La llegada a Arabia y Palestina (The arrival to Arabia and Palestine), by me. 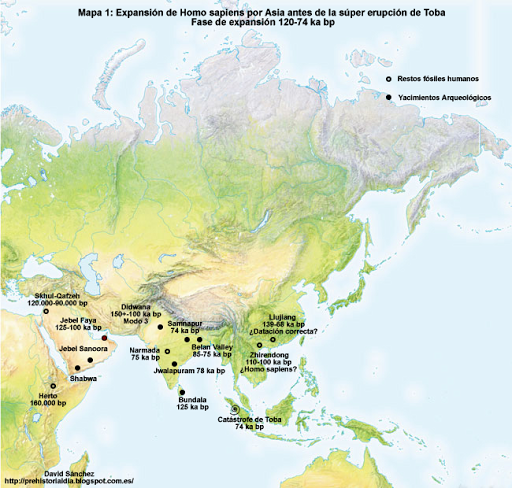 La expansión de Homo sapiens por Asia Meridional desde la perspectiva arqueológica (The expansion of Homo sapiens through Southern Asia from the archaeological viewpoint), by David. There is still a lot to do for the series to be complete but the time for a synthetic review in this blog is quite overdue. I will skip the brief intro to population genetics on the belief that most readers here have a decent idea, but the other three articles ask for due mention. The latter may well be calibrated with the archaeological evidence for the arrival of H. sapiens (MSA) to Southern Africa (L0d), which may be as old as 165 Ka but shows a clear increase in density since c. 130 Ka. I’d rather lean for the later date, that is roughly coincidental with the beginning of the Abbassia Pluvial, which must have provided good opportunities for expansion also in more northernly latitudes (the other nodes). The first expansion is harder to estimate but c. 160 Ka. is a time in which we can see some of the first signs of expansion of our species within Africa (Jebel Irhoud and the already mentioned first Southern African MSA) so it is a tentative date. I also mentioned the expansion of L3, which preludes the migration Out of Africa, but this was already discussed in this entry. 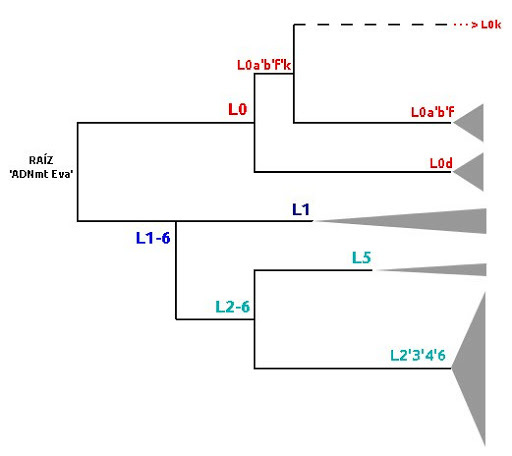 In addition to reviewing the archaeological discoveries of the last few years (and few older ones) I also discussed the issue of Neanderthal admixture, which most likely happened in this phase, and the possibility of some L(xM,N) lineages found in Arabia being from this period (see here). I must say that the design of the maps is not quite the way I would have done myself but is still interesting. Very especially I miss lots of info on post-Toba South Asia. Also the Altai transition is not really well explained in my understanding. 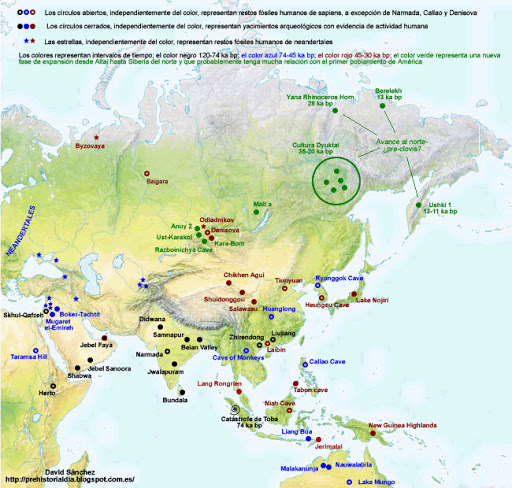 On the other hand East Asia is full of details and the overall picture of the archaeology of the Eurasian expansion is well described nonetheless. PS- from the commentaries by David at his blog, it seems clear that he gives for granted the occupation of South Asia after Toba and therefore he did not consider it important to mark any more recent sites in the subcontinent.